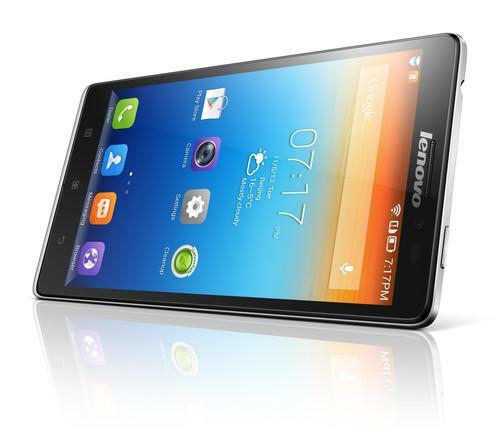 Lenovo's Vibe Z is the company's first LTE handset, but it will not be available in the U.S.
Lenovo announced its first LTE smartphone and other handsets priced between US$219 to $549, but none will be immediately available in the U.S., one of the largest mobile device markets. Headlining the new lineup is the sleek Vibe Z, which has a 5.5-inch screen and is the company's first LTE smartphone. Starting at $549, the smartphone will initially ship in parts of Asia but not the U.S., where LTE has been most widely deployed. Other new products are non-LTE models and targeted at budget buyers. The 6-inch S930 smartphone starts at $319, and the 4.7-inch S650 starts at $229. Both share common hardware and are intended to bring high-end smartphone features to inexpensive handsets, said Keith Liu, director of launch marketing at Lenovo. The new products will be shown at the International CES conference next week in Las Vegas. Lenovo is well established in PCs and tablets, but sees a big growth opportunity in smartphones with total unit shipments expected to reach 1.5 billion units in the coming years, Liu said. Smartphone shipments for the company grew 78 percent year over year, and the new additions will expand the company's offerings and worldwide reach, Liu said. The company so far has sold a majority of its smartphones in China. "We are gearing up to play in this area in a very, very big way," Liu said, adding that smartphones and tablet shipments outpaced PCs for Lenovo. The Vibe Z has a 1920 x 1080 pixel screen, and can display images at 400 pixels per inch (ppi). By comparison, the iPhone 5S has a 1136 x 640 pixel and 326 ppi display. The Vibe Z weighs 147 grams, is 7.9 millimeters thick and has a "premium" build with titanium plating and a fabric-like texture. The handset has the Android 4.3 operating system. Other Vibe Z features include a 13-megapixel rear camera, 5-megapixel front camera, 16GB of storage, the latest 802.11ac Wi-Fi, a quad-core Snapdragon 800 processor and 2GB of memory. It will become available in February in the Philippines, Thailand, Malaysia, Indonesia, Saudi Arabia and United Arab Emirates. With the LTE connection, the smartphone can download data at speeds of up to 150 megabits per second and upload data at 50 megabits per second. Lenovo did not talk about the LTE spectrum support, which could determine wireless network compatibility. The $319 S930 smartphone has a 6-inch screen with a 1280 x 720-pixel resolution. It can be used as a tablet or smartphone, much like Samsung's Galaxy Note products. The $229 S650 has a 4.7-inch display that can show images at a 980 x 540 pixel resolution. Both the S-series smartphones are 8.7-mm thick, have two SIM slots, 8-megapixel rear cameras, 8GB of storage and quad-core MediaTek processors. Also introduced was the $219 A859 smartphone, which has a 5-inch 1280 x 720 pixel screen, an 8-megapixel rear camera, two SIM card slots and a MediaTek quad-core processor. It is cheaper than the S-series smartphones, but is thicker at 9.2 millimeters. The S-Series and A859 smartphones run on Android 4.2, recognize gesture controls, and have software that make it easier to take and edit photos. The products will be launched later this year in parts of Asia, Europe, Central America and Latin America.